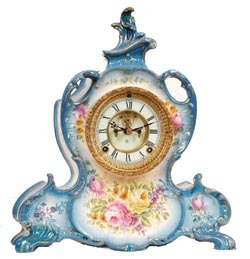 Ansonia Clock Co., Royal Bonn, "LaVendee", ca 1904. One of their more poplar styles, they were made in many colors. This case is primarily medium blue with gold used to accent the blue all over the case. The flowers are pink, white, yellow, lavender, green, and many other shades of those colors.The flowers were all painted on a white background. Note the loops, twists, and twirls over the case. It is another large one at 14.5" high, 13" wide.Ly-Ansonia, page 638 has 3 examples.